The Barber Pole – Do you know its story? I do not know if the same thing has happened to you but I have been asking myself for a long time, every time I saw these typical poles, what would be the meaning of them and their colors. So at last I have decided to get down to work and share their meaning with those who are curious about the subject. The most widespread meaning dates back to medieval times, where it was already placed on the walls of the houses of those who carried out the job of barber. 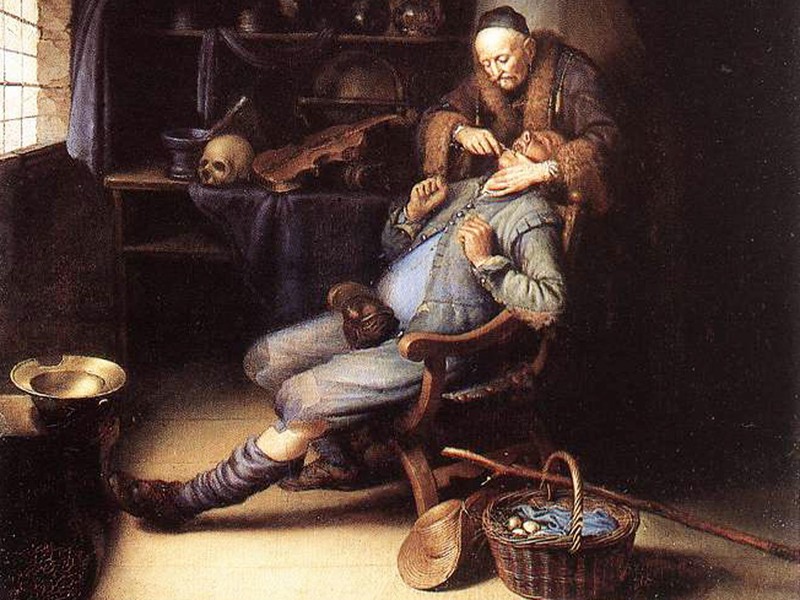 It should be noted that, at that time, a barber was not only a man who trimmed your hair or beard, but also made from trepanations and simple surgeries to bleedings and teeth extractions. Due to the lack of culture of that time, it was believed that such trepanations relieved pressures in the brain and that madness could be cured with them. Also they thought by performing these bloodletting, the patient’s improvement was achieved by letting the blood excess and the possible bad humors that it could harbor out. Needless to say all these activities used to lead to drastic consequences for patients. 1.- Using thousands of leeches on the patient. 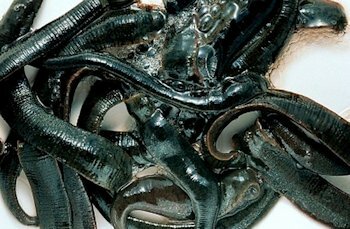 These leeches were kept in a bronze basin that was represented in some poles of barbers, placing it at the top of the pole. 2.- Making a direct incision in a vein and letting the blood flow in a basin. 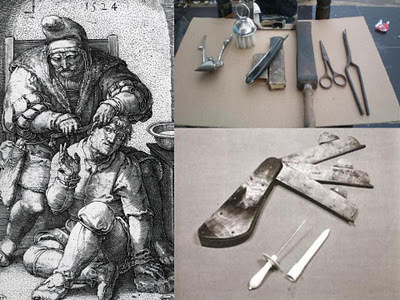 To do this they submerged the patient’s limb in hot water and when the veins looked good, the patient grasped a wooden post hard to inflate the veins, at which time the barber took advantage of the incision and the blood fell to another basin called bloodshed. Said blood basin is represented in some barbers poles, placing them in the lower part of the post. At the beginning the barbers announced their services by placing on the walls of their businesses the posts that painted white on which they then left wrapped in them the bandages full of blood they used in their bloodletting or surgeries. With the passage of time they decided not to be so grotesque and chose to place a red pole to which white bandages were rolled. Later appeared the tricolor posts, of which the most famous is the one that alternates the colors blue, red and white. Some suggest that red represents arterial blood, blue represents veins and white the bandages. Others attribute it to adoption by American barbers, who decided to give it a representative touch of their national flag. 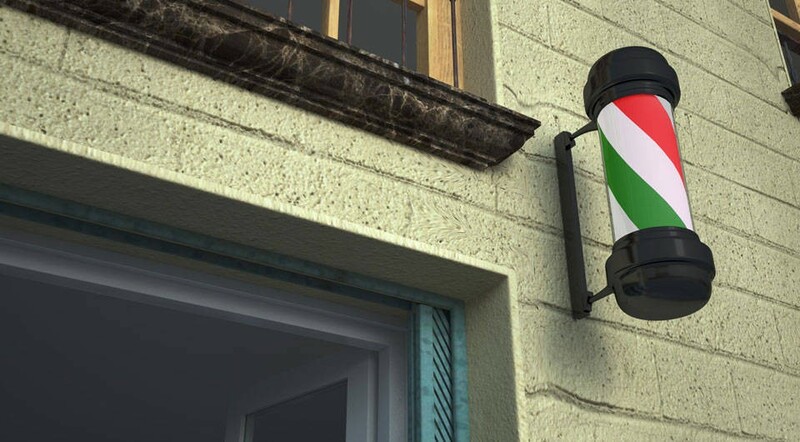 Personally I think that, given the great variety of colors of barber poles that exist, the option that each barber in each country gives a national touch is the most approximate. That is a very good precept, no doubt. Thanks for the article, heard about it before somewhere, but not in so much detail! Yes, it is difficult to imagine but the truth is that the mentality of the medieval era left a lot to be desired: they burned at the stake people who used herbs to heal, to give an example. This is so crazy and had no idea!!! Happy though that barbers are not shedding so much blood anymore! Great research! It is even hard to believe that a few hundred years ago this could happen with impunity, huh? Thank God now the barbers only shave your beard. very interesting,,, I never knew! Always a pleasure to share with you all kind of interesting info! Yeah, far better to stick just in a beard trimming or a hair cut! Thanks to you for reading and for your compliment! Totally true! A very dangerous and bloody multitasking! I was aware of some of this already but not the bandages wrapped around the pole – very interesting @dresden. Cheers. Yes, that’s where the colored bands come from; bloody bandages wrapped in a white pole…; do you imagine how grotesque? Agh! I did not know the Barber Pole story. Interesting! Something so everyday but with so much history hidden behind…. I didn’t know this story, thanks for sharing @dresden! I’m happy then that you thought it was interesting. I didnt know the history until i read your post, thank you! Thanks to you! My pleasure!